The Yellowstone grizzly bear population is once again in serious trouble. During 2008, the bears suffered a double disaster: grizzlies died in record numbers and global warming dealt what could be a death blow to the bear’s most important food source. […]I’m saying the Department of Interior’s principal public agency responsible for protecting Yellowstone’s grizzlies is currently incapable of doing so. The Interagency Team/Committee has become an insular institution deaf to public opinion; it has pandered to state game departments who speciously argue that “socially acceptable” local opinion should replace the best available science to determine where grizzlies may live. I have questioned whether this population’s removal was premature. One time Doug and I cordinated two former Vietnam Special Forces guys to do some camera work on the illegal salts in the Thorofare. These were guys the Sierra Club had just used to document off illegal off road travel in the Gallatins. They were battle hardened when it came to aggresive abusers. But after 3 -4 days in the thorofare they came to me and said it was going to take some heavy resistance to the outfitters doing this illegal hunting…and thus killing of griz via all the meat left on site….in order to make it safe to do the filming needed. The turf was the outfitters and they were using their guns and horses in a manner where it was both unsafe near the salts (flush them off the hunting areas anywhere within miles of the salts, or on the trails. They would charge their horses at these supposed back packers ….these two were guising as normal backpackers…and try to track them to their camp. The two said it would not be safe being discovered near any salt. They told me these outfitters and guides were as violent as anybody they had ever come upon. It was a lawless land to them….and these were two guys who had gone through a lot in Vietnam. Anyway, I’m sure Doug is well aware of what is killing bears. he is vocalizing what the agency guys already know but do nothing about. Turning management over to state game and fish is like asking the fox to protect the chicken house. The game wardens HATE bears. They do not like to do management on these bears in the summer so why would they ever ask an outfitter any details on any griz killed? Yes, of course the feds responsible know what the attitudes are of the state “protectors”. Chuck Schwartz is very knowledgeable. So why does any negative info have to be wrung out of him at these meetings? I imagine he justifies it by thinking if he wasn’t there it would only be worse. Well enough is enough. He needs to take a stand… now, not after he “retires”. All this compromising just makes for govt. guys running around with their heads hung down. …And easier for the aggressives to chop it off. There needs to be a house cleaning like Doug says. Wow, great article. Insightful, thoughtful, informative, authoratative—-too bad people like that aren’t on the interagency committee. Nor are they likely to be! Seems like only thoughtless “yes men” are sought for government work. At the bottom of the article there is an email address to send a letter to. I just sent mine. Thanks for the additional insight Bob. When I was doing field studies in Washington state in the early 90’s I was working elk herds around the Willard area which is just a few miles from the Columbia River Gorge and a few miles east of Carson Washington, I stumbled upon 5 wolves, when I reported it, I was told, no way no how and not to talk to anybody about it. The upper admins said there were no wolves officially in WA and they would not speak about it…I to, was transferred to study in a different area! Wildlife management has more dangerous politics in it than a career in politics. You have got that right! The above quotation from Peacock’s commentary, with very minor changes, perfectly describes a widespread pattern of abdication of federal responsibility to ineffective and pandering “interagency” groups, including the Mexican Wolf Adaptive Management Oversight Committee (AMOC) and what some of my friends call the “Jaguar Conversation Team” for its total failure to do anything meaningful to protect and recover jaguars in the U.S. Yes and only some kinds of local opinion are acceptable. It has to come from the “right people” who have the “right kind of occupation” and /or political friends. Save bears I live not too far from Willard in Stevenson. I too have seen evidence of wolves in the area and was told I couldn’t know what I was seeing even though I had digital pictures of the tracks which were 5 1/2 inches wide and almost 6 inches long. I have learned not to report wildlife evidence. All this makes me wonder how much information has been sweep under the rug . maybe there is a lot more. Now there is a plan here to convert forest floor debris into bio-fuels and give the old loggers some new work. . that means they will make the national forest look like a tree farm . .then they will have to kill all the black bears because the black bears will resort to eating the cambium layer of the trees to survive when there are no bugs and rich stuff on the forest floor for them. I wrote a letter to the local paper about it and some of the people in the industry stopped me on the street to have a talk with me. They were friendly but I am glad I am not trying to make a living around here as that kind of thing can get you fired no matter who you work for. I’ve had reports of wolves in WA state — central Washington — and they were not the wolves near Twisp. I love that area of the state, I used to hunt a lot up around there as well as around Trout Lake, South Prairie, Carson and did a lot of hiking and camping in the Indian Heaven Wilderness area, I am thinking of moving to Carson, nice little town with out many people! But it does sound like things are depressed around there, I was through Carson a couple of weeks ago and noticed the Grocery Store has now closed, so would have to do shopping in Stevenson..
Yellowstone grizzlies never should have been delisted; now the same folks that delisted them–Chris Servheen and his Interagency Grizzly Bear Committee–will not only use the system to avoid re-listing grizzlies, they control the data that would prove it’s time to relist grizzlies. Servheen got grizzlies delisted by using “new math” to increase Yellowstone’s grizzly bear population. No matter how many bears get killed now, Servheen can always come up with a new math formula to prove grizzlies are doing OK. The only way environmentalists can beat Servheen is to hire a Ph.D. mathematics professor from MIT. I agree with a lot of what has already been said by Mr. Peacock & comments here. 1. Peacock misstates the role of whitebark pine in Yellowstone grizzly bears’ diets. Calling pine seeds “the bear’s principle fall food” is misleading, because there are many Yellowstone grizzlies that rarely eat whitebark pine seeds, and most Yellowstone grizzlies get through non-mast years by eating other things. The correct characterization is that abundant whitebark pine seeds were probably the biggest single factor in the growth of the Yellowstone grizzly population from the mid-1980s til recent years. Not because every single bear was eating whitebark seeds, but because many reproductive age females were doing so. The seeds provided them with high-quality nutrition (fat & protein) right before denning up for the winter, which increased their likelihood of emerging with new cubs, as well as the likelihood of having a large litter of cubs. Also, female grizzlies that used whitebark pine were less likely to be in conflicts with people, since whitebark tends to be up on high ridges and out of harm’s way. They’re probably also less likely to have run-ins with male grizzlies, because the males in the fall are more likely to be seeking elk meat. Why is this important to understand? Credibility. If advocates misapprehend what the science is telling us, folks in the agencies will condescendingly dismiss you — write you off as a Chicken Little type who can’t grasp the science. Yes, it’s true that whitebark is important, and that without it we should probably expect Yellowstone grizzlies to be on long-term downward trend. But not because every bear used to rely heavily on whitebark. The relationship between population trend and whitebark is clear, but it plays out in marginal changes in reproduction and recruitment that add up to major trends in population growth (or decline). 2. I wish Peacock was correct about this, but I’m not really sure that ESA protection actually did much to stop hunters from killing grizzlies. Maybe the 2008 spike in mortality was truly related to hunters thinking they could let their guard down, I don’t know. But how many hunters got prosecuted for killing grizzlies when they were still listed? The availibity of whitebark pine and cutthroat trout played a major role in getting grizzlies off the endangered species list; they’ve both gone. Less bear food = less bears. Not all bear food has equal value. Trout and whitebark pine seeds are high calorie snacks. A griz would have to eat a ton of sedge to get the same amount of calories as a couple of cutthroat trout. If high calorie whitebark pine seeds are not available, griz go for the gut piles from elk, which leads to conflicts with hunters, and dead bears. 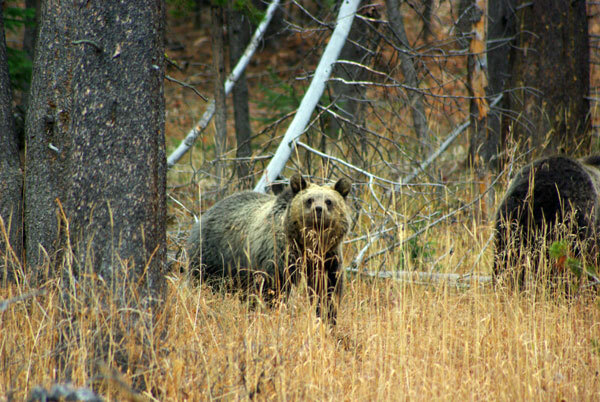 Under the ESA, grizzlies did recolonize old haunts far beyond the borders of the “Primary Conservation Area” where grizzlies are offered reasonable protection. One third of “Yellowstone’s” grizzlies live outside the PCA. Without endangered species act protection, those are dead bears. They’re not socially acceptable. It’s OK to kill them because, well, they’re grizzly bears. i don’t disagree with your second point – i will say, however, that I think that listed status would give grizzlies better legal opportunity at addressing any problem (including hunters thinking they can let their guard down) via opportunity at compelling updated BAs, etc. – it would certainly grant advocates a greater legal handle at bringing such issues before managers. I stumbled upon 5 wolves, when I reported it, I was told, no way no how and not to talk to anybody about it. The upper admins said there were no wolves officially in WA and they would not speak about it…I to, was transferred to study in a different area! Save bears, even though I do not have to worry about losing a job due to this, I would almost be hesitant to report a sighting of something like a wolf or grizzly outside of the accepted range. With stories like that it makes me wonder what is going on in the San Juan Mountains in Colorado where people have reported grizzlies since the last confirmed bear was killed in 1979. The griz on Two Ocean Plateau would leave the pine nuts for the gut piles of the Thorofare as soon as the gun shots started. One time on the way to Marioposa Lake on the South boundary I counted 11 different, and all fresh, tracks coming off the plateau. the elk season had started the day before in Thorofare and was still closed on the other side of the Plateau. Thus all tracks led East to the shots. Griz prefer gut piles (actually a lot more meat than guts on left on those salting stations) over pine nuts, whether it is females or boars. Its just that the females get pushed out once all are in the Valley. Sap thanks for the information on the whitebark pine . .nicely written. I am sure you are right that being well informed makes a point much better taken than to generalize about it. However, Peacock does have an ear with the general public and I like to see him taking the time and still having the passion to get his essays out. And thank you Bob Jackson for yet another illustration of what happens during hunting. Wish we could sit down and interview one of the wise old grizzly mothers who have managed to make a living for her and various cubs for years out of habitat smattered with humans and lack of huge protein sources. I bet that would be even better than “science”. Concerning griz mortality and the ESA, one has to remember that even though the F&WS wasn’t aggressively pursueing leads on illegal griz killing for a number of years (starting in 2001) they still used eyewitness accounts to prosecute the incidents where it was a locked in conviction. Consequently, a guide would be afraid his dude hunter might turn him in …. or a hunting bud or fellow guide might turn in a guy after their friendship soured. When the bear was listed the consequences were a lot higher. Thus after delisting there wasn’t as much fear….therefore even more bears killed by “hunters” after delisting.